Product prices and availability are accurate as of 2019-04-18 18:14:54 EDT and are subject to change. Any price and availability information displayed on http://www.amazon.com/ at the time of purchase will apply to the purchase of this product. 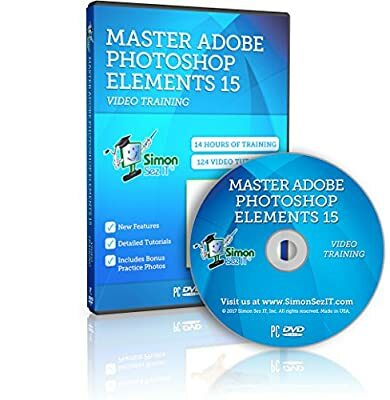 Master Photoshop Elements 15, the complete course for casual photographers who want to learn Photoshop and achieve professional results. 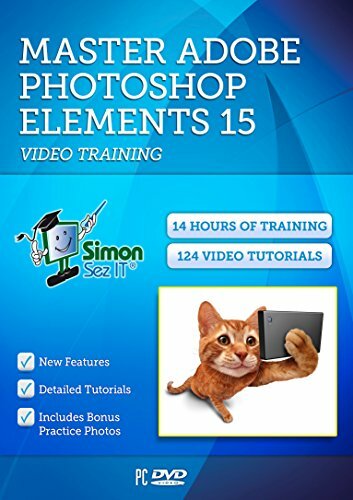 Now you can have the advanced skills required to use Photoshop Elements 15 like a pro. This 14 hour course starts right at the very beginning showing you how to download the software and get it going. Then we carefully walk you through each and every step toward becoming a true Photoshop power user. Use these skills for your job, your hobby, or even start a new business. Many Photoshop courses are designed for people who have some experience using the application. While this course will be very useful to students with experience, it was designed for the person who has never worked with Photoshop before and knows nothing about it. The course Includes optional exercise files to practice what you learn. Also included are the instructors demo files, and a package of royalty free digital photographs. Each Simon Sez IT training course offers hours of expert quality training videos for every level of computer experience. Follow along on your own computer as you watch and learn from the trainer's narrated instructions and movements. This self-paced learning environment allows for stress-free learning in the comfort of your own home or office. Play, pause, rewind and repeat as often as you like. This is a computer DVD which is compatible with Windows computers only. It will not work with a DVD player connected to a television.